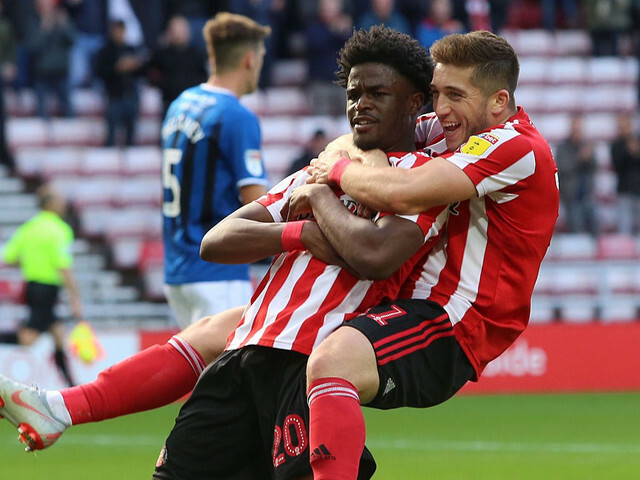 Sunderland silenced the doubters with an impressive win over Rochdale on Saturday. What are the main talking points from a performance which many who wear red and white needed to see? Lynden Gooch sees himself joint top for assists in League One with four. He showed that he does more than just create goals on Saturday. His pace and trickery invited Ollie Rathbone to bring the American international down in the area leaving Trevor Kettle with little choice but to point to the spot. Gooch tucked his penalty strike into the bottom right hand corner with aplomb to beat Josh Lillis. He was a nightmare for Rochdale's back three, offering an outlet and taking defenders on. The work rate and endeavour of the academy graduate once again returned dividends when he stroked a beautiful curling shot inside the far post in the second half. Gooch is indispensable in this unique formation Jack Ross has the lads playing. He has the tenacity and intelligence to track back in defence and the cutting edge quality to cause problems in attack. In short, he's the perfect player to fill the right wing back spot in Ross's lopsided 3-5-2. This season in League One has seen Gooch cement his position as an integral part of getting the club promoted. We know he's magic but it's getting a bit cliche. The way our young academy graduate is playing at the minute has many Black Cats fans singing 'He's better than Joel Asoro' (who is happily warming Swansea's bench at present). Maja has managed seven goals in nine games. An awesome return for a player most fans were expecting to bag a modest amount. This season he's emerged as a ruthless finisher and there's more than a hint of Jermaine Defoe in the manner he's scored. The touch to take the defender out of the equation for his second was sublime and getting himself into the box more for crosses his proving fruitful. He could end up Sunderland's most important player when the season wraps up. Dylan McGeouch has had a strange time at Sunderland so far. Imperious with his quality and time on the ball in preseason but seems to have regressed in the league. He still seems behind the pace and isn't really having that much of an impact on the game. Fans that saw him before the league kicked off will know all about the ability he possesses. But recently his underwhelming displays have paved the way for Max Power to return on Saturday. McGeouch is a clever player that likes to play the game at his own pace. The problem recently is that he hasn't been able to impose his game and dictate proceedings from his deep lying midfield role. With Lee Catermole playing out of his skin and causing midfields all types of problems, it looks like the Scottish international will miss out. Sunderland seem to miss Powers energy and willingness to have a shot. There's no doubt that when McGeouch is on it he will have a major say in games but while he works his way back to top form he's far from safe in this Sunderland XI.